I honestly don't think I'm taking too many liberties when I say that few other films, that match the above description, are so well known and so well loved by horror movie fans than William Castle's "House on Haunted Hill". oh come now you knew there had to be one, is that at midnight the house is locked shut and no-one can get out until 8 am the next morning. debts. Watson Pritchard(Elisha Cook) is the owner of the house whose own brother was murdered there, his true motives for attending are not revealed but I have my suspicions. Lastly there is the comely Nora Manning(Carolyn Craig), a secretary at one of Loren's companies who is taking care of her entire family. I'm sure she can really use the money. Can she be brave enough to stay the entire night though, or live to see the morning for that matter? "House on Haunted Hill" was director William Castle's second only film as an independent producer/director, the first being "Macabre"(1958). Although he was a contract director at Columbia and Universal for nearly twenty years prior. His most notable credit being as the second unit director on Orson Welles' "The Lady From Shanghai"(1947). 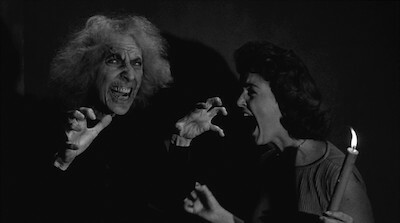 "Macabre"(1958) was a resounding success at the box office, in no small part thanks to Castle's gimmickry during promotion. 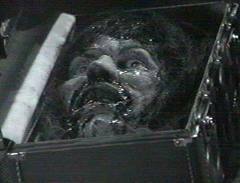 The success of "Macabre"(1958) was enough for Allied Artists to give Castle $200 000 to produce "House on Haunted Hill"(1959). The movie was co-written by Rob White, who Castle met while they were both working on the TV series "Men of Annapolis". Castle and White would collaborate on five films("Macabre"(1958), "House on Haunted Hill"(1959), "The Tingler"(1959), "13 Ghosts"(1960) and "Homicidal"(1961)). Exterior shots of the haunted house were filmed on location at the Ennis-Brown House(2655 Glendower Avenue, Los Feliz, Los Angeles) which is today listed on the national register of historic places. The film was shot over 14 days from September 3 to 16 1958. Annabelle lashes out at her husband by calmly saying "Darling, the only ghoul in the house is you" to which he replies "Don't sit up all night thinking of new ways to get rid of me. It makes wrinkles." While Price and Ohmart manage to successfully skirt the line between charming and menacing with relative ease, Elisha Cook's portrayal of a drunken, ranting Watson Pritchard offers a stark contrast. From the very first he seems almost resigned to the fact that the house will claim more lives before the dawn arrives. His ramblings about ghosts and savage murders manage to not only set the other guests ill at ease, but the audience as well. Castle manages to paint an appropriately grim, nearly gothic landscape on his black and white canvas. The dust clad, cobweb laden set jumps out at you and screams "Pay attention! No good can come of this place". His judicial application of light and shadow, although not rivaling the level of a Fritz Lang or Orson Welles, adds sufficiently to the atmosphere without being distracting. Hill" was first released a big draw card for the film was it's use of Emergo. Emergo was, at the time, William Castle's latest gimmick. Basically, a plastic skeleton was attached to a pulley system and, at the movie's climax, was reeled over the audience supposedly emerging(hence emergo) from the screen. While this did manage to scare a few, as news of it spread, it served more as a moving target for unruly youth to use as target practice. Have a look, the skeleton is even listed in the credits. Now it's fairly obvious that Castle styled himself after Alfred Hitchcock. From appearing in his movie trailers, having a signature silhouette to making cameos appearances in some of his films. Then accepting that imitation is the highest form for flattery, Hitchcock decided to return the compliment in 1960. After seeing the success of Castle's films Hitchcock felt inspired to make his own low budget, black and white, horror schlock film. The result was "Psycho"(1960), one of my personal top five movies of all time and an undeniable classic movie. 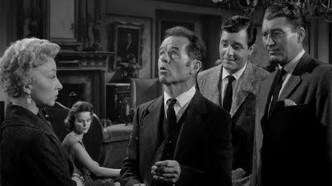 Castle, not content to let Hitchcock have the last say, then responded with "Homicidal"(1961). Back to "House on Haunted Hill" though. This movie is a quintessential William Castle experience. It may not be the most frightening movie you'll ever see, especially by todays blood drenched standards. It may not even be the best crafted film, no Oscar nominees here to be sure. But what it is, and what it was meant to be is fun. Castle contended that for 90 minutes or so you forget about reality, let go of your concerns and allow yourself to be entertained. To partake in an experience. 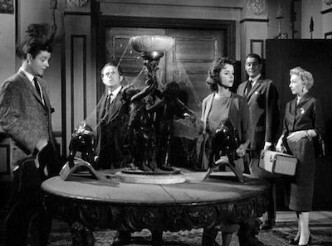 And in that "House on Haunted Hill" succeeds with remarkable style. Now, I would feel remiss if I did not mention Calolyn Craig who does a wonderful job playing Nora Manning in this movie. Her transformation from a composed, young, wide-eyed innocent(although from the way she flirts with Mr. Schroeder, perhaps not quite so innocent) to full on panicked hysteria ready to resort to violence at the end is fascinating to watch. She very nearly manages to steal the entire show. So if you are in the mood to have some guilty fun in the early hours of the morning. Turn off the lights. Serve up some treats. 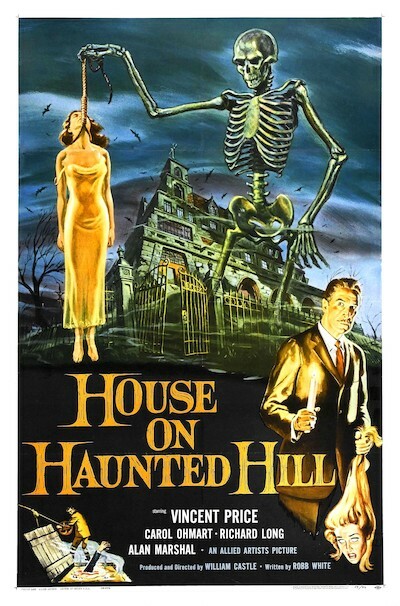 Then pop in "House on Haunted Hill". Your classic movie master recommends it with 3 ½ pills on the madness meter.